One of the major churches in south Stockholm, Katarina Church, was originally built by royal decree in the 17th century. It has been destroyed by fire twice and was reopened after the second rebuilding in 1995, restored to its former glory with a large dome and four smaller towers. It is a large and imposing building, seating up to 900 people in its wooden pews. In addition to its stone floors, white painted stone walls and splendid carved marble, is the gloriously ornate new organ, built by J.L. van den Heuvel Orgelbouw. 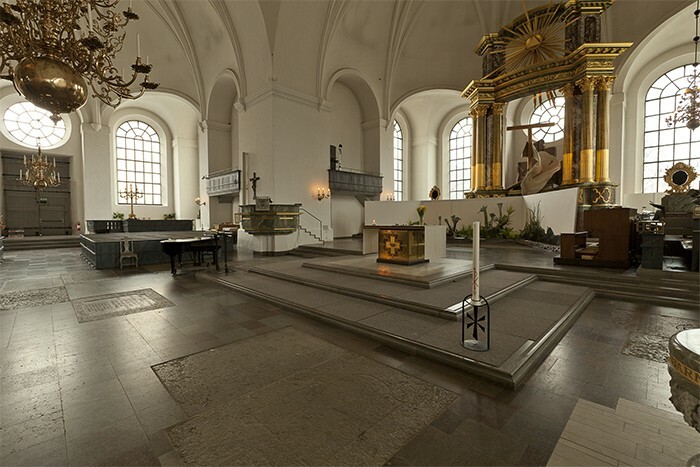 Like many churches, over the years Katarina Church had seen a variety of attempts to resolve the acoustics of its highly reverberant and complex space with different loudspeaker solutions. Karl-Gustaf Kahlau of Renkus-Heinz Swedish distributor Luthman SMTTS AB explains: "The PA they had originally was a traditional horn system, and after that there was an attempt to introduce a traditional line array system which looked pretty intrusive and didn't work well in acoustic terms. "The biggest problem was the interior acoustics with such a long RT, up to 8 seconds, and around the 100Hz region it's even worse." Now, Luthman SMTTS AB has updated the most recent PA system with an extra Renkus-Heinz digitally steerable system. Kahlau continues: "A single Renkus-Heinz digitally steerable Iconyx IC32 column was demonstrated to the church, and after tuning the multiple beams, using BeamWare, to focus on specific areas of the congregation, it performed fantastically well and the church people were delighted. "It was great for everyday use and provided perfect speech intelligibility for sermons and so on. But because this is a very event-filled church, with up to 1,000 people at many large events, they were renting in supplementary units to add more coverage and power especially for those events. So a recent decision was made to expand the existing single mono system, based on one Iconyx IC32 with IC16s as fills, into a stereo system with one IC32 on either side. With a little fine-tuning, again using Renkus-Heinz BeamWare to focus multiple individual beams from both columns on the different areas of the seating, the stereo Iconyx system has performed fantastically well without the need of any additional equipment, even for the largest events. "Normally no subwoofer is required, as the system is capable of going down to around 80Hz, sufficient for most of their needs, but one can be added as and when required. "It's been a great success and has completely solved their acoustic issues while blending in perfectly with the beautiful architecture."